A few weeks ago, we were super excited to hear news of a real working hoverboard. And now that we've tackled Back to the Future, Electrolux has its sights set on the Jetsons. The Electrolux Design Lab has whittled down 1,700 entries from 27 countries to six finalists in its tech design contest for students. The theme of the competition is to prototype healthy living solutions for the future—specifically, culinary enjoyment, fabric care and air purification. "For this year’s global design competition, we asked students to submit concepts based on our theme 'Creating Healthy Homes,' " says Lars Erikson, head of group design at Electrolux. "The finalists' concepts are truly innovative and offer new ideas on how we might be living our lives in the future, whether it’s eating healthier or being more sustainable." The winner will be announced next week. And while there's no guarantee these products will ever hit the shelves of your local Best Buy, it's definitely a step in the right direction. Your kids will eat that cauliflower now—because it tastes like potato chips! If this thing ever exists, I'll be putting some grass and dirt on the plate, and saying "STEAK!" 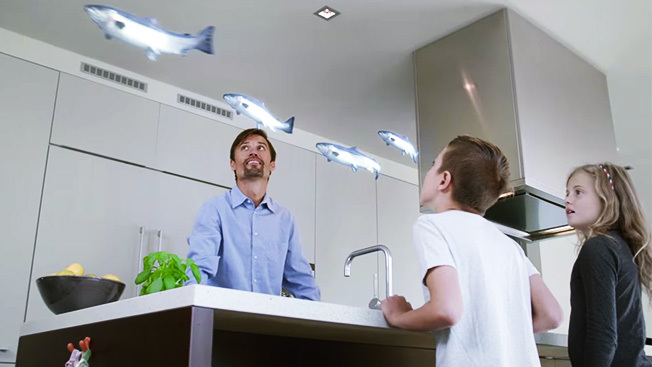 In the future, you can hunt fish with a lightsaber, and a man will deliver one to your door in plastic wrap! Here's the one I could actually imagine being sold at Bed Bath & Beyond. In the future, the air will be cleaner. But it will also be full of drones and these weird things. "Here you go, honey, I drank a two-liter of Coke Zero and turned the empty bottle into this dress. Let's go. We're late." This "seed of fresh air" would be particularly handy if you have flatulent roommates or partners.